A beautiful Mother’s Day Centerpiece that you can make right at home to celebrate the special day. Mother’s Day is right around the corner. As this special time approaches, we are reminded to thank and honor those women in our lives who have encouraged and cheered us on the most. And what says Mother’s Day more than a beautiful bouquet of flowers? However, as a mom (and a daughter) I know that mothers love something homemade from the heart, and heart heathy is always an added perk. 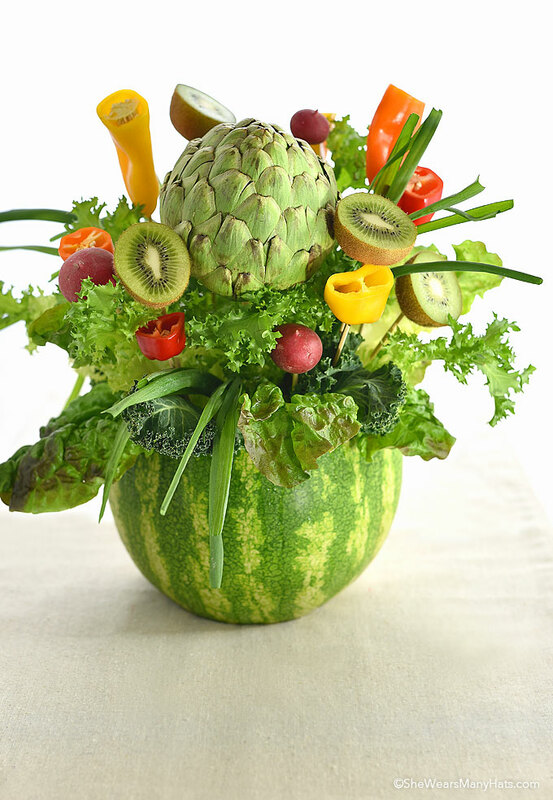 Enter this lovely Marzetti® brand produce bouquet. This beautiful edible Mother’s Day Centerpiece is the perfect delicious gift for any mother, momma, mum, nana, grandma or mom this Mother’s Day. 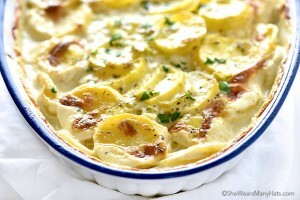 Plus with summer approaching, Mother’s Day is the holiday with the best feel good, taste good, look good food. The Marzetti produce bouquet is super simple plus, for every like and/or share (up to 5,000) of their stop-motion video, Marzetti will donate $1 to The Mommies Network!. If you haven’t heard of The Mommies Network, it is a 501c(3) non-profit organization dedicated to helping moms find support and friendship in their local community. They started as one chapter in Charlotte, North Carolina in 2002 and launched a network of chapters in 2005. They currently operate about 80 local communities across the country and have over 30,000 active members. It’s for a great cause, so be sure to like and/or share the video! The ingredients are simple. 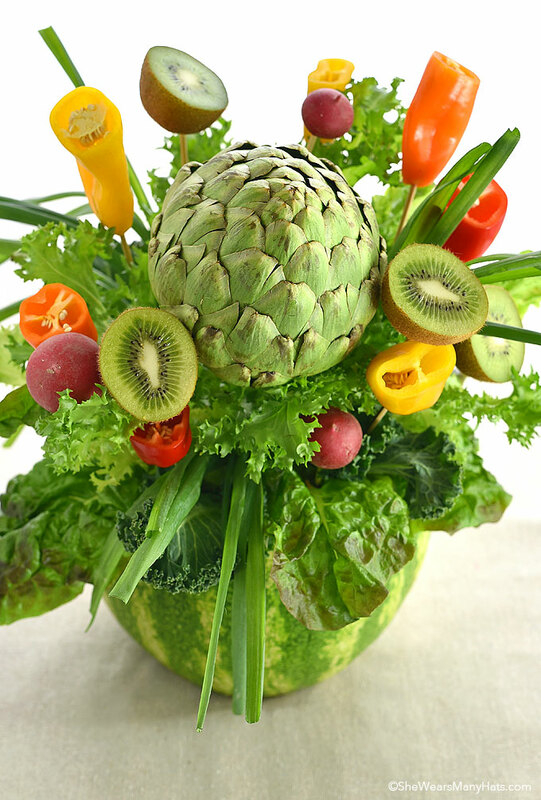 You’ll need a watermelon, an artichoke, kiwis, peppers, some pretty leafy greens and veggies and you’re set! I did add some green onions and radishes that I had on hand for some extra texture and color. This how-to video shows you the easy step-by -step process and the lovely finished product. Just follow along to place and primp your produce to perfection! First, cut a third off the top of the watermelon. Hollow out the watermelon about halfway down using a spoon or watermelon scoop. 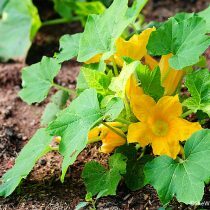 Next, lay the lettuce or kale (or both) in a ruffled fashion over the edge of watermelon to create a leafy base for the bouquet. Trim the bottom of the artichoke and stick the sharp end of a skewer through it. Then poke this artichoke skewer through the center of the watermelon. 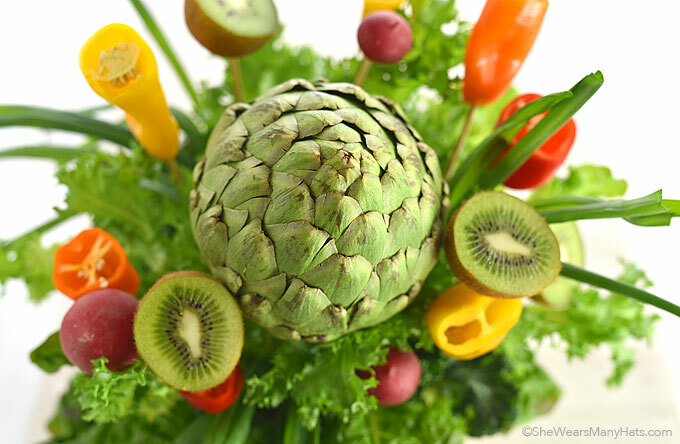 Cut the bottom off of several peppers and skewer, placing artfully around the artichoke. Next comes the kale or other lettuce. Poke strong stalks into the watermelon or use toothpicks to hold them in place. Cut the kiwis in half and skewer so the delicately patterned cross-section is showing. Same goes for the colored peppers, with the end cut off their flower-like insides can show. 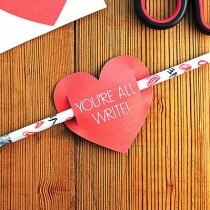 Place these evenly around the bouquet for a pop of color. Again, I added some green onions for texture, and a few radishes for additional color. 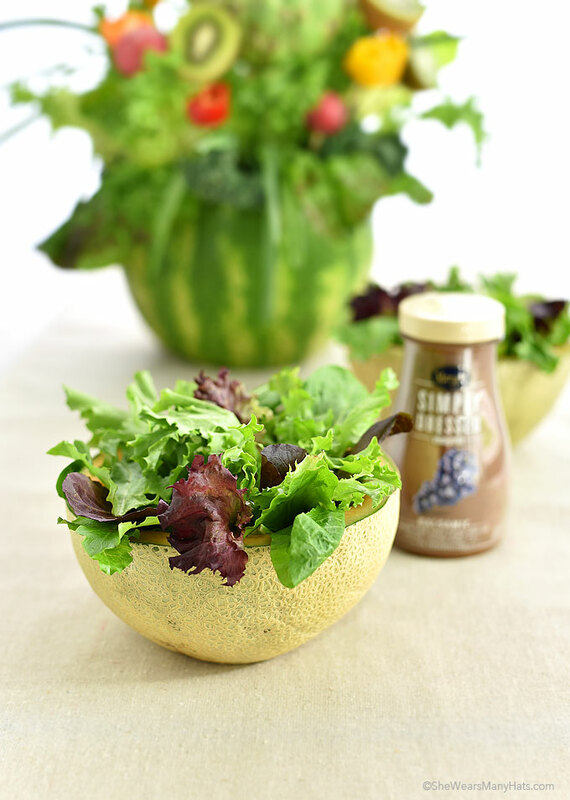 For a fun way to serve tossed salad, use cantaloupes or honeydew melons cut in half and hollowed out. 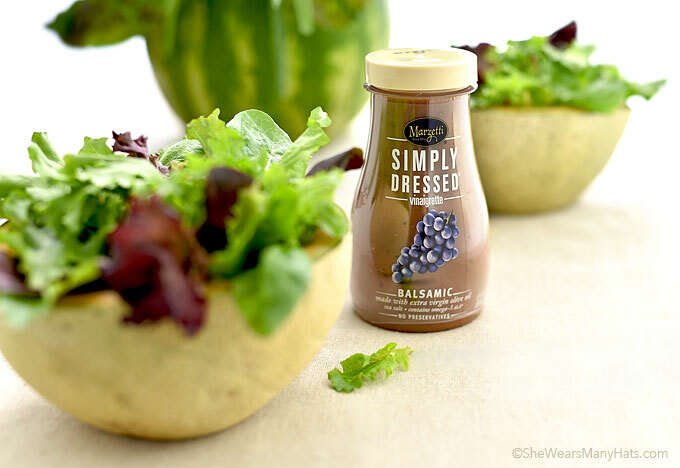 Toss salad greens with your favorite salad dressing, like Marzetti®’s Simply Dressed® Balsamic Salad Dressing and fill melon bowls with the salad. 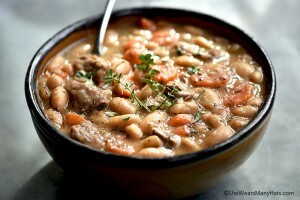 Be sure to follow Marzetti’s on Facebook for more fresh ideas like this. Don’t toss the melon that you carved out. Serve it as fresh fruit platter or fruit salad. 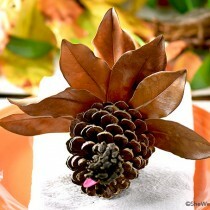 Get creative and play with this centerpiece to your heart’s content for the prettiest arrangement, and voila! Happy Mother’s Day! I have been invited to participate in a Marzetti ambassador program. This post is sponsored by Marzetti and product has been provided by them. As always the opinions and ideas expressed here are my own. Have I told you I miss your hat pictures at the top of your blog? I do. This would be the perfect gift for my Mom, so pretty!